One of the most commonly asked questions of me, behind what mascara I use, is what hair products I use. It probably has something to do with sharing genes with this girl, but I’ll take it! I’m always flattered when someone compliments my hair because I like to take my time styling it. In fact, I would take a good hair day over a good makeup day any day of the week. I would rather go to an event with well-styled hair and not a stitch of makeup on my face, than perfect makeup and air-dried hair. Okay, okay, you’re getting the picture – I like styling my hair. What makes my hair style well is the products that I use, though. Without them, I have pretty limp, lifeless hair. It’s not great. I’ve never air-dried it and been able to do anything with it but wash it again and use these products. Depending on your hair, of course, some of these products may work for you or not. These are some that I’ve used over many months, if not years, so I know that they work really well for me. 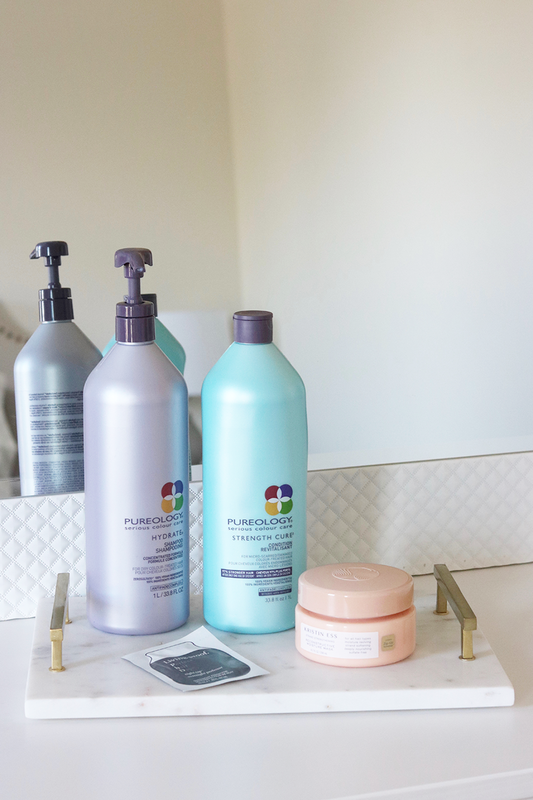 Arguably one of the most important aspects of haircare is finding a shampoo and conditioner that do what they’re supposed to do, and do it well. 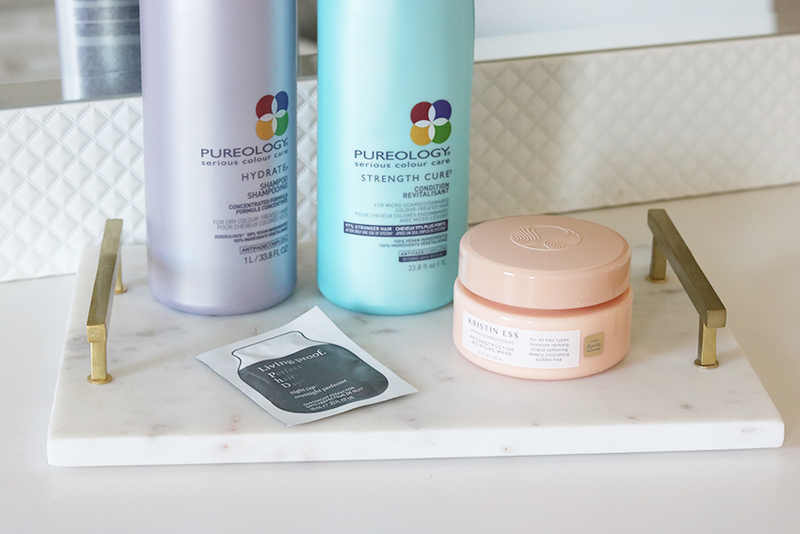 I’ve been using Pureology products for a few years now, since my sister converted me, and have found this combination of Hydrate Shampoo and Strength Cure Conditioner works well for me. It cleans my hair without overly drying it or weighing it down. I do switch out one or both of them every few months, but have found this to be a great combination for me. I try to keep my hair washing to about 3 days a week. I used to be the girl that had to wash my hair every single day if I didn’t want to walk around looking like a grease monger. Over time, though, I would wait a little longer between washings, which allows me to go about 3 days without feeling like a total scrub. 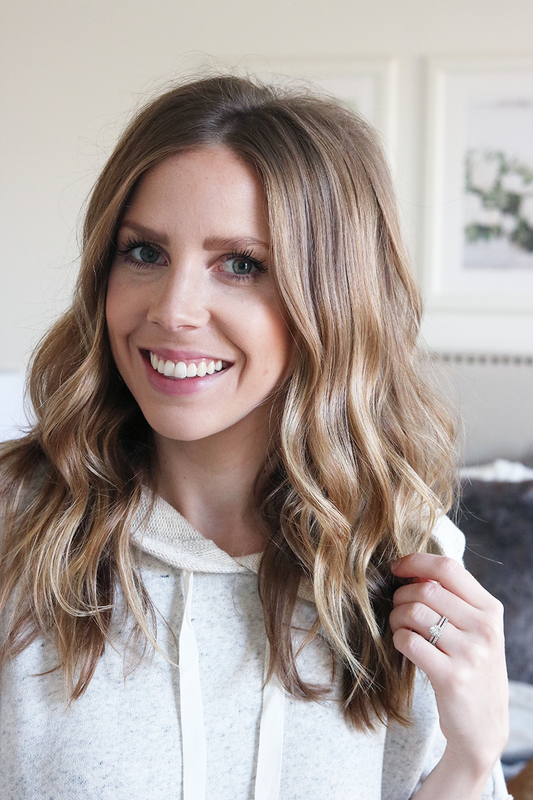 It makes getting ready in the morning way less daunting and has been so much healthier for my hair – less heat touching it each week! At least one of those washes, I like to use this mask on my ends to help repair some damage and smooth it out. Because I heat style, my hair is much more prone to breakage and damage on my ends, so it needs all the help it can get. I’m really bad about remembering to do a deep conditioning regularly, but when I do, I like using this one. It’s not too heavy and doesn’t completely soften my hair to where it can’t be styled the next day. I just put it on at night, after washing my hair, and let it do its thing overnight. It couldn’t be easier! 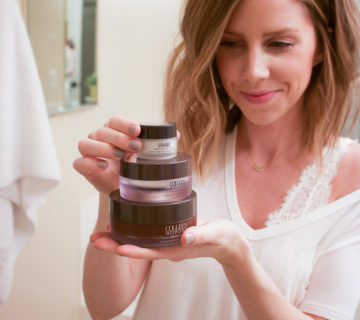 When it comes to actually styling my hair, I have an arsenal of products that I like to use. They all serve a different purpose and are used in different situations, but like my shampoo and conditioner, I’ve been using them for awhile, so I know they work well for me. After washing, I wrap my hair in one of these and let it dry a bit while doing my makeup. When I’m ready to blow-dry my hair, I apply this uplifting foam at my roots, all over my scalp. (To see how to apply, watch this tutorial.) After that, I pump a small amount of this mousse into my hand, rub it around a bit, and then work through my damp hair from about mid-shaft to ends. This stuff really does work for me – it actually plumps my hair and gives it a good working texture. Then I blow-dry upside down! After blow drying, I typically curl with this curling wand. (I have an old tutorial that shows my curling method here. It’s probably time to do a new one 😂) When it’s all curled and ready to be finished, I start with a little dry shampoo. Like I mentioned before, my hair is naturally pretty lifeless, so I need as much help as I can get when it comes to volume. 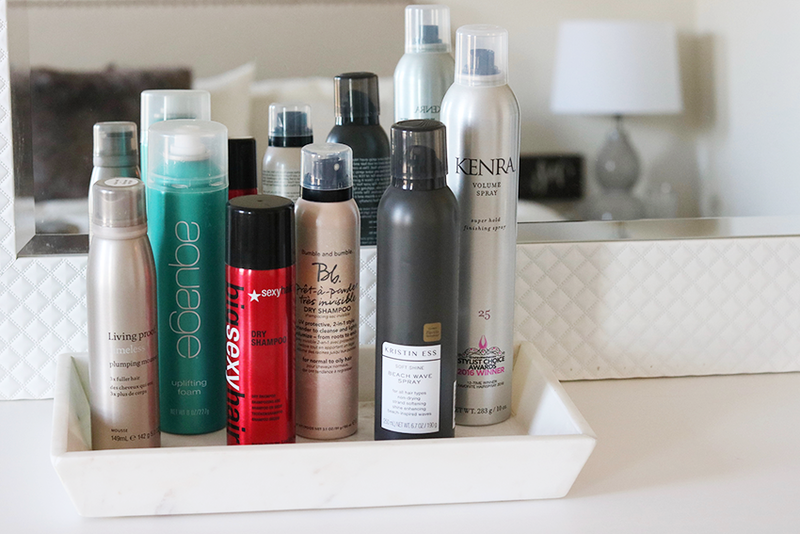 What works really well for me is adding in a little bit of this dry shampoo because it adds such good texture. It creates a great base for teasing and holding my curl all day. Because it does add quite a bit of grit, I only use it on freshly-washed hair. If I use it on dirty hair, I find it’s too heavy. 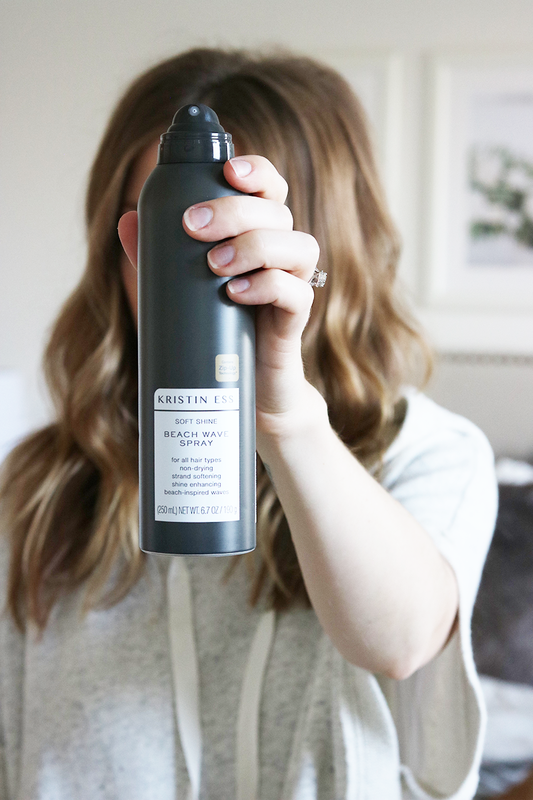 For dirty hair days, I’ve been liking this lighter dry shampoo. When I remember, I spray and work it in at night, so that it can do its thing while I’m sleeping. It smells great, too! Once I’ve teased and added volume, it’s time to finish. I like using a bit of this beach wave spray just in my curls. 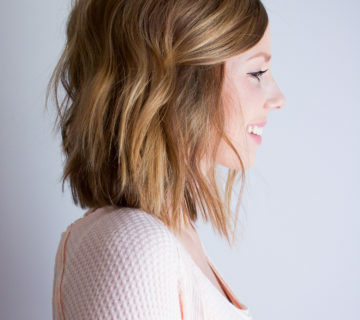 It adds good texture and pieces out the curls a bit, so they don’t all blend in together. A little goes a long way with this, so use sparingly! Then it’s time for my favorite and most-overly used product, this hairspray. I use a generous amount to set my hair and then I’m ready for the day! I’m wearing this hooded poncho! 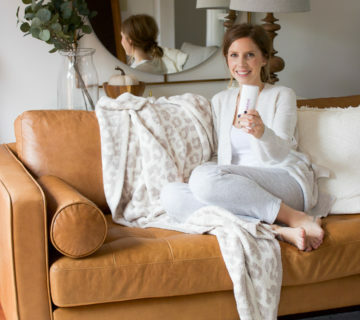 I love the Kristin Ess products! I use the leave in spray, beach wave spray and texture spray on the regular. I haven't tried the moisture mask yet but I've been curious about it. I think I'll have to try it now! Hi Lauren! I have gotten into the habit of washing my every day otherwise it gets so oily. Any tips for training your hair to be able to only wash it 3-4 times a week? Just slowly ease your hair into it! Go a little bit longer in between each wash and eventually you will be able to. I need to start actually styling my hair! I ALWAYS just let it airdry then deal with it later haha. Thanks for the product recs. I have the nume wand too. Which barrel do you use for your curls? I switch between the smallest and middle, depending on what I'm feeling! I’d LOVE to be able to go a day or two in between washes and my hair is very fine (and limp like you said yours is), but it’s also frizzy too at first after I dry it. What’s your recommendation re dry shampoo because EVERY one I’ve used makes it extremely staticky?! Help! I love to see the products that other people us on their hair as I am still yet to find the 'one' product that clicks with me. Will definitely be trying our pureology & your hair looks amazing, I love that you are proud to take time over your appearance! How did you transition your hair from having more blonde/highlights back to your natural color? 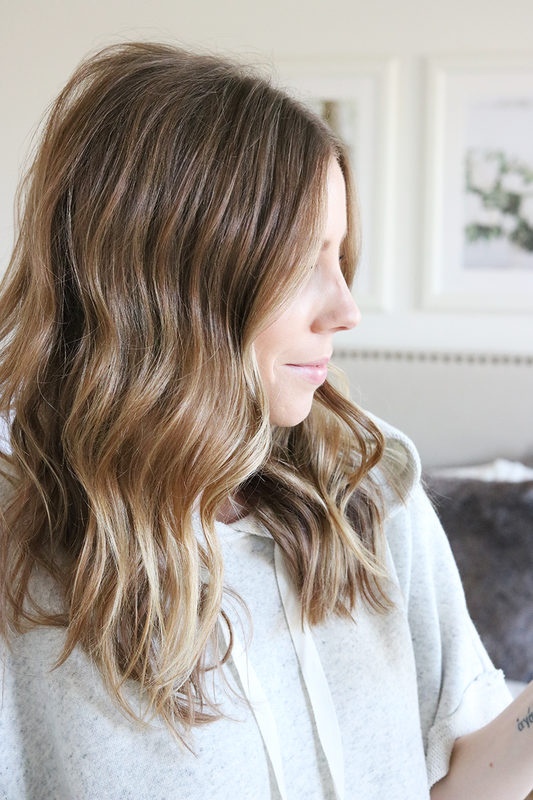 I bleach, blow dry, and heat style my hair and I’m trying to get back to healthy locks! Your hair the way you describe it sounds a lot like mine.